Did you know that having diabetes can have an effect on your feet? Did you know that a Podiatrist should be part of your diabetic team of doctors? Diabetes is a disease that causes tour blood level of glucose (sugar) to be elevated. It can affect your heart, blood vessels, nerves, kidneys, eyes, skin, mouth, and the foot. Excess sugar in your blood hurts the small blood vessels that feed your nerves, especially in the legs and feet. This can cause burning, tingling, numbness, and pain, especially at night. It starts at the tips of the toes or fingers and gradually spreads up your feet, legs, and arms. 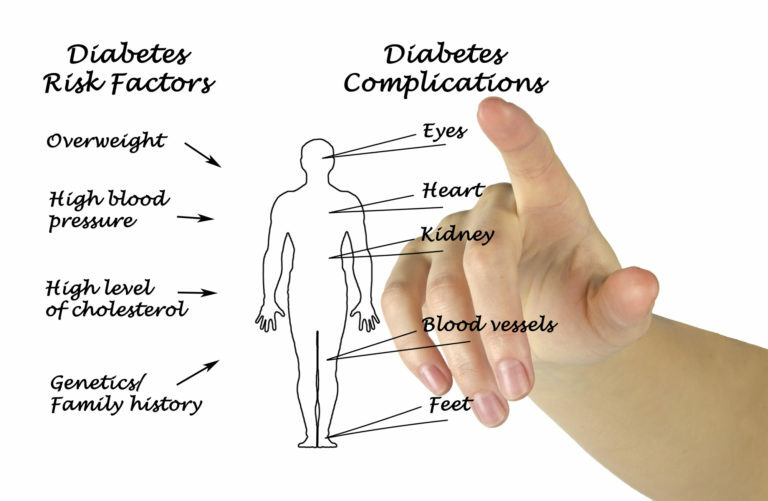 Poor blood sugar control can cause you to eventually lose all feeling in the affected limbs. Diabetes also increases your risk of cardiovascular problems. Narrowing of the arteries, calcification of the blood vessels, chest pain, heart attack, stroke, and high blood pressure are some of the problems you’re at higher risk for. Nerve damage in the feet or poor blood flow to the feet can cause a lot of serious foot complications. What may seem like a simple cut or blister can become serious infections that may lead to toe, foot or leg amputations. Do you know 10 people with diabetes? How many of those people will get a foot ulcer during your lifetime? The answer is 1-2 of them. For every 10 people with foot ulcers, 1-3 will require an amputation. I’m performing these amputations almost every week. Once a diagnosis of diabetes is made by your doctor, visit your podiatrist. If you have no blood flow or nerve issues and your skin and nails are otherwise healthy, then you should see your podiatrist once yearly. If you have mild nerve damage (neuropathy) or mild blood flow problems, then visit your podiatrist every 6 months. Some of you may have excessively thick toenails or callouses that are difficult to cut, so visit your podiatrist every other month and he or she can cut them for you. They have special tools. This is also an opportunity to have your feet examined for any problems. Callouses should be shaved down and modifications on your insole of the shoe should be made to reduce pressure over the callous. Custom diabetic orthotics or insoles may need to be made. If you see blood under the skin, alert your podiatrist immediately. This is a huge red flag that you will ulcerate in this area if it’s not treated immediately. What about ingrowing nails? Visit your podiatrist and have it treated immediately. Ingrowing nails mean the nail is growing into your skin. It will cut your skin and can cause infections. If you have bunions and hammertoes or other foot deformities that cause rubbing against the shoe, then ask your podiatrist about diabetic shoes or extra depth shoes. An extra depth shoe means there is more space inside the shoe so it is not as tight as regular shoes. There are also shoes with stretchy upper materials so your hammertoes don’t rub. These areas can also breakdown, which we want to prevent. Inspect your feet daily. You’re looking for objects that may have lodged onto your foot, color changes, drainage, cuts, and bruises. Make sure you inspect your feet during daylight and use a mirror on the floor if you cannot pull up the bottom of your feet to look at them. If you see anything that doesn’t look or feel right, then call and see your podiatrist immediately. Don’t forget, your podiatrist is part of your diabetic team. At least a once-per-year check-up will help avoid amputations. If anything changes with your feet, please visit your podiatrist.